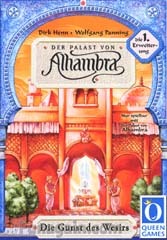 This is the first expansion to Alhambra and actually consists of 4 mini-expansions that can be added separately or togehter. I particularly like the bonus cards and the huts, since they take away some of the certainty of the game and allows for surprising comebacks. This is a must buy expansion for fans of the base game.